Ok… so this recipe doesn’t have to be made in “tartlet” form, but I was trying to make something that would be easy to transport to a Happy Hour function and the amazing sale on filo dough shells at my local grocery store sealed the deal for me. I made a double recipe and used it for two boxes of filo shells AND an extra large graham cracker crust pie shell… and it worked perfectly. The filo dough shells aren’t my favorite choice for this recipe – the shells are a bit too “papery” and I much prefer having something with a buttery or graham cracker-y taste – but they served their purpose and allowed me to make a “single serve” treat for my friends. Since I’ve been working at James River Cellars for over a year now, I knew that I was going to try and incorporate some wine into the recipes that I traditionally use for Thanksgiving and Christmas dinner. I’ll probably use more wine (in slightly concealed amounts) when I repeat this meal for Christmas, but I started with the pumpkin pie recipe, with great results. This recipe, given to me by my mother-in-law, only calls for 2T of water so I felt fairly safe substituting it with James River Cellars’ Reserve Chardonnay. What took me most by surprise was the consistency change that happened when I added the milk mixture to the dissolved Knox brand gelatin. Thankfully, the glue-like consistency loosened as the mixture came up to temperature, but it was a little disconcerting at first. 1. Blend together 1-14oz can sweetened condensed milk (I use the fat-free version), 1 egg (slightly beaten), 1t ginger, 1/2 t nutmeg, 1/2 t salt and set aside. 2. In 2 qt saucepan, sprinkle 1 envelope Knox gelatin over 2T water (in this case, James River Cellars’ Reserve Chardonnay), let stand ONE MINUTE, then stir over low heat until gelatin dissolves. 3. Blend in milk mixture that you made in step 1. 4. Stir over low heat until slightly thick, about 5 minutes. NOTE: Don’t worry if the gelatin mixture seems like glue at the beginning… it will loosen up as the heat brings everything to temperature and allow the entire mixture to thicken. Don’t be hasty and remove from heat too early – this is how the pie eventually sets up as it cools. 5. Blend in 1-16 oz can solid pack pumpkin (not seasoned can of pumpkin pie) and whisk thoroughly. 6. Pour into pie shell (I use a pre-made graham cracker pie shell, cuz that’s what M likes best – feel free to substitute a traditional pie crust if you prefer) and chill for several hours. 7. Cut and serve with cool whip or Redi-whip. If you decide to make an entire recipe of little baby pumpkin pies, know that you’re going to need three boxes of shells… it makes a lot of those things. 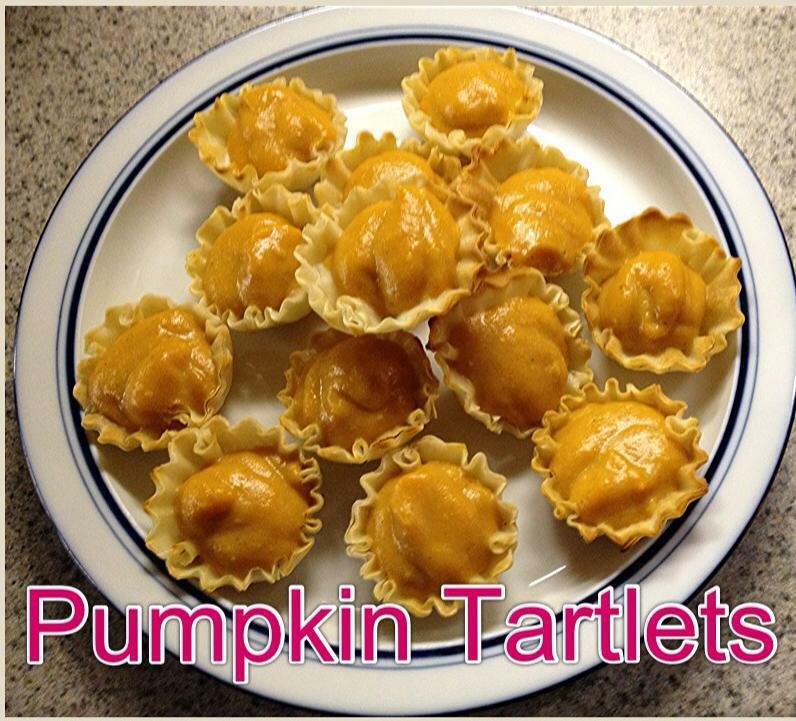 I simply like the idea of using the word “Tartlets” in a post after hearing John Lovitz turn the word into something hysterically funny on Friends so long ago… if you’re not familiar, feel free to click on the “tartlet” link above… you’ll be laughing pretty quickly! I wish you all a joyful Thanksgiving and a most blessed Holiday Season! This entry was posted in Cooking, Recipe, Wine and tagged Friends, holiday baking, James River Cellars Reserve Chardonnay, John Lovitz, pumpkin pie, substitutions, tartlets.